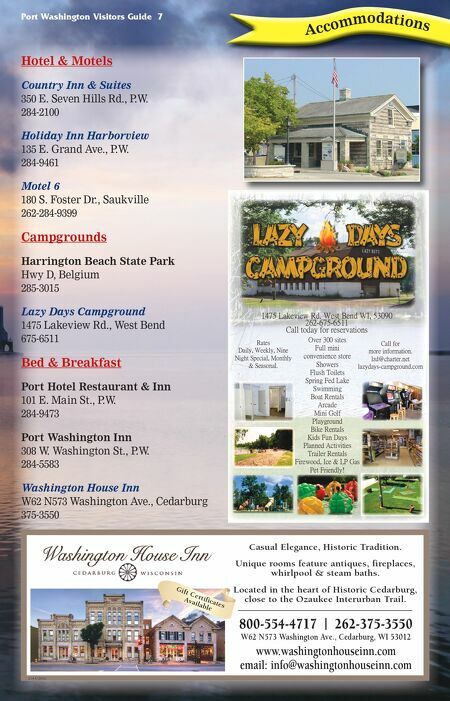 6 Port Washington Visitors Guide CountryInn & Suites by Carlson 350 E. Seven Hills Rd., Port Washington, WI 53074 800-456-4000 • 262-284-2100 • www.countryinns.com • Complementary Hot Breakfast • Pool, Whirlpool & Fitness Center • Free High-Speed Wireless Internet • Banquet Facilities for up to 400 • Additional Meeting Rooms • Onsite Pub, Arcade, Lending Library ...and much, much more! Conveniently located between Milwaukee & Sheboygan on Hwy 43 254372022 Best Value & Exceptional Service...Guaranteed! 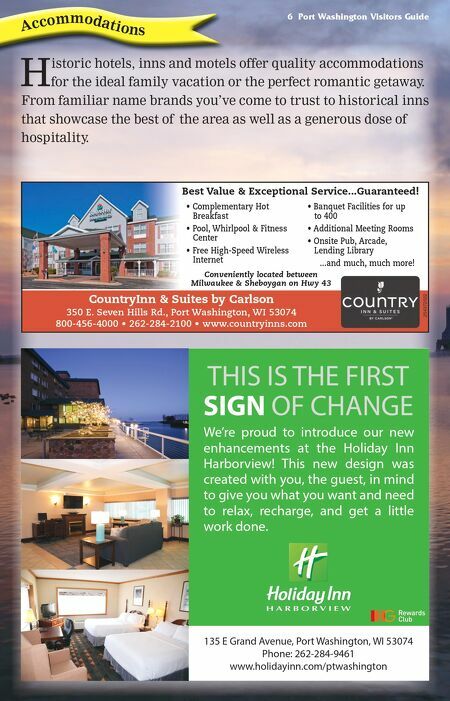 We're proud to introduce our new enhancements at the Holiday Inn Harborview! This new design was created with you, the guest, in mind to give you what you want and need to relax, recharge, and get a little work done. 135 E Grand Avenue, Port Washington, WI 53074 Phone: 262-284-9461 www.holidayinn.com/ptwashington THIS IS THE FIRST SIGN OF CHANGE A cco m m o d ati o n s H istoric hotels, inns and motels offer quality accommodations for the ideal family vacation or the perfect romantic getaway. From familiar name brands you've come to trust to historical inns that showcase the best of the area as well as a generous dose of hospitality.